A graphite rubbing by Nikolina Kovalenko from the new “Reclamations” exhibit at Union County’s Trailside Nature & Science Center in Mountainside. A portion of sales from the exhibit will go to benefit local communities in the Brazilian Amazon and help fund reforestation projects. MOUNTAINSIDE, NJ – The Union County Board of Chosen Freeholders is pleased to announce an exhibit of the selected works of artist Nikolina Kovalenko, who draws inspiration from trees of vanishing rainforests. The artist, who holds a gold medal from the Russian Art Academy, is interested in our vanishing connection with nature and its consequences. Ms. Kovalenko’s work will be the on display at the Trailside Nature and Science Center, and is presented in partnership with the Visual Arts Center of New Jersey. 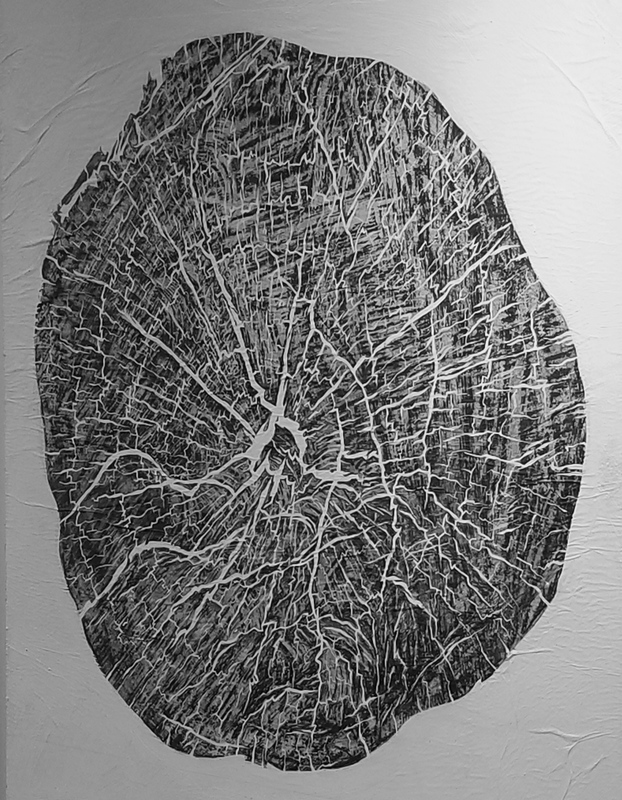 Entitled “Reclamations,” the graphite rubbings represent the unique fingerprints of trees harvested in the Amazon rainforest. Kovalenko visited the Amazon rainforest in 2017 to document the results of the logging process. While there, she interviewed environmentalists and independent activists working in the area to restore the rainforest. She took their fingerprints as well. The exhibit represents a synthesis of her conversations, and the rubbings of the “fingerprints” she took of both man and trees. “This exhibit will captivate its audience with a new and sensitive perspective on these magnificent trees,” said Freeholder Chairman Sergio Granados. The exhibit runs from October 2018 to February 2019. It is open to the public and free of charge. The artwork presented in this show is for sale, and a portion of the profits will be donated to local communities in the Brazilian Amazon to help fund reforestation projects. For more information about the exhibit, please call the Trailside Nature & Science Center at 908-789-3670 or visit ucnj.org/trailside. Trailside is open 7 days a week from noon to 5:00 p.m. It is located at 452 New Providence Road in Mountainside and is a facility of the Union County Department of Parks and Recreation.